When king Salman bin Abdul-Aziz al Saud in early October, first entered the Russian land (despite a small technical problem with the gangway at arrival), Saudi Arabia sent a strong signal to the world in General and USA in particular. The fact that the visit of the Saudi monarch in Russia can be called historic for several reasons. Although the Soviet Union was the first country to recognize Saudi Arabia in 1926, leaders of the Kingdom never went in the Soviet Union and (until recently). In addition, relations between the two countries in recent years has become rather controversial: for example, a confrontation in Syria and Yemen. Moscow supports the regime of Bashar al-Assad, and Riyadh — opposition, and both capitals are among the main actors in the Syrian conflict. Vladimir Putin and king Salman (a traditional ally of Washington) established the convergence of the signing large military and energy agreements on the occasion of the first visit of a Saudi monarch to Russia. Riyadh, signed a preliminary agreement on the delivery of the famous Russian missile systems s-400, as well as their production in the Kingdom, which, by the way, also ordered the American anti-missile system THAAD. In addition, the Russian-Arabian agreements involve the purchase of anti-tank systems "cornet", systems of volley fire TOS-1A, grenade launchers AGS-30 and assault rifles AK-103. Deliveries are accompanied by a transfer of technologies "Cornet", TOS-1A and AGS-30. As noted the head of Russian diplomacy Sergei Lavrov following the talks, agreements bring Russian-Saudi cooperation to a new level. These acquisitions Riyadh (if true, which I doubt respondents La Tribune columnists) have two clear objectives. First of all, slow down to block Iran-Iraq-Syria-Hezbollah, a traditional ally which is Russia. Saudi Arabia came to the conclusion that you will not be able to destroy this Alliance, however, got through the Russian channel of communication in case of tension (Yemen, Bahrain). And it is, apparently, willing to pay a few billion for the channel, said one observer. 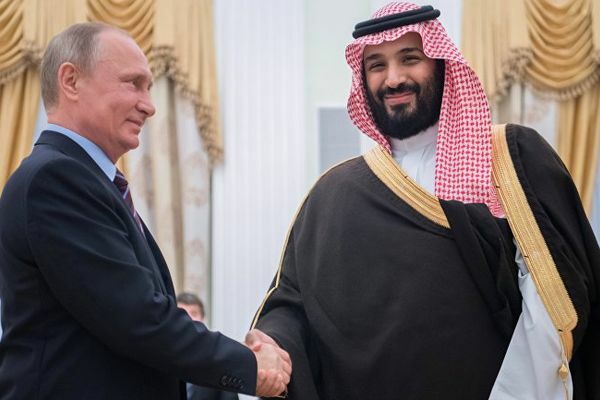 The rapprochement between Moscow and Riyadh also contributed to their leading role in the signing of the largest oil producers agreement to combat a collapse in prices, which was a heavy blow to their economies. Saudi Arabia managed to achieve the second objective, i.e. to restore order in the global oil politics, even if the United States continued to increase production and their exports took off. Riyadh controls production and pricing policies of OPEC, but he did not have any influence on other producers-Russia's allies (Iran, Venezuela, Algeria). "We are committed to continuing the positive cooperation of our countries to stabilize world oil markets," said king Salman for talks with Vladimir Putin. Given that the implementation of the program of development, by 2030, Saudi Arabia needs higher prices (and hence reduction in the production), she was left with no choice but to establish ties with Russia. The task performed because of OPEC and its ten partners (including Moscow) agreed in late November on the extension of production quotas until the end of 2018 to stabilize the rising prices. For Russia, this agreement is beneficial at least that was upsetting a number of organizations such as NATO (an old enemy), which is already rocked by an unexpected Alliance between Moscow and Ankara. Would NATO insist on expansion projects in the Persian Gulf? In the framework of the OPEC card mix the fact that the leader of the organization and Russia go to the international oil consortium. From the point of view of Russia the opportunity was too lucrative to miss. "Moscow is one shot kills three birds with one stone and take advantage of the situation to eliminate the Saudi religious diplomacy in sensitive regions (Chechnya, Dagestan)," — said the aforementioned expert. In addition, Russia gradually penetrates deeper into American strongholds in the region (UAE, Turkey, Saudi Arabia), not abandoning the support of traditional allies (Syria, Iran, Iraq and Egypt). The Gulf countries and the Middle East, in turn, demonstrate a greater openness to Russia. Example of this are the recent projects and contracts in the region (UAE, Kuwait, Egypt...). Russia does not throw allies, but at the same time, able to conduct diplomacy on another front. Thus, the Russian-Arabian rapprochement symbolizes the growing role of Moscow in the middle East.